Russian presidential spokesman Dmitry Peskov has refrained from expressing his opinion of Michael Flynn. Trump offered post of national security adviser to Lt. Gen. Michael T. Flynn, rumors say. Russian presidential spokesman Dmitry Peskov has refrained from expressing his opinion of Michael Flynn, whom US President-elect Donald Trump has invited to take the position of national security adviser. "It will be possible to say something only after some appointments to positions in Trump’s future team have been made. At this point we have nothing but forecasts and rumors," Peskov told the media. When asked to share his impressions of Flynn, who had visited Russia just recently, Peskov replied: "Regrettably, I cannot say anything, because I’ve had no long conversations with him. It is hard to exchange opinion on any serious matters while you are seated at the table at an official event." 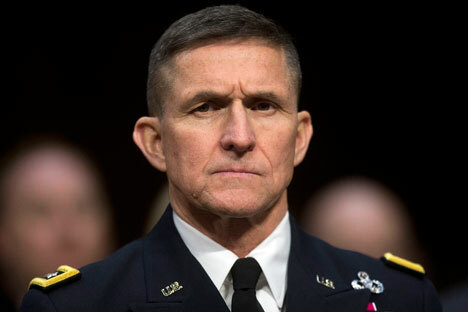 Flynn had visited Moscow and attended an event arranged by the RT television news channel.